Word has it George Lucas, as producer, has been working on this WWII flick (directed by Anthony Hemingway) since the late '80s. You’d think a couple of decades would be time enough to concoct fully developed characters and credible dialogue. As it is, this tribute to a group of black pilots in the Tuskegee program, relegated to the ground for much of the war, doesn’t venture far into complex race relations, glossing over them in a simplistic, sentimental way; only one scene---in which the pilots are invited into a whites-only bar for a congratulatory drink for their heroism (protecting the white pilots)---attempts to go beyond this. A historically captivating story, with black leads (a rarity in Hollywood, unfortunately), is turned into an epically long schmaltz-fest with mediocre CGI effects. 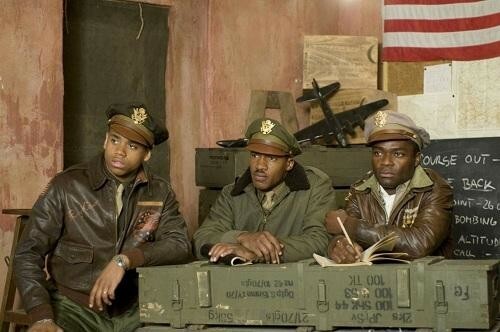 The Tuskegee pilots (and viewers) deserve better.